U.S. Senator Cindy Hyde-Smith (MS), middle, meets with members from Mississippi State University’s Stennis-Montgomery Association during a luncheon on Capitol Hill with the Mississippi congressional delegation and staff in Washington, D.C., March 14, 2019. 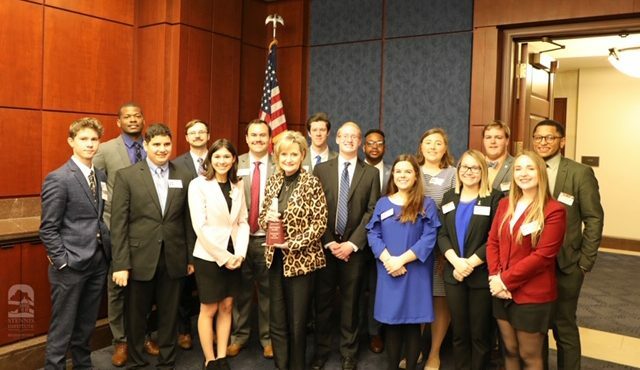 Mississippi State University (MSU) Stennis-Montgomery Association (SMA) students recently visited Washington, D.C., to learn more about public service career opportunities and leadership on Capitol Hill. The SMA is a student organization at MSU that encourages students from different backgrounds and academic disciplines to participate in politics. It serves as a resource for students who want to register to vote and immerse themselves in the political process of their community and nation. Throughout the year, the SMA sponsors speakers on campus and provides workshops that guide students through the application process for internship positions in Washington, D.C., and across the United States. Each year, approximately 30 of the most active SMA members travel in March to our nation’s capital. On March 11, 2019, the Stennis Center for Public Service hosted the SMA on a tour of the Marine Barracks Washington, D.C. The Marine Barracks Washington, D.C., also known as “8thand I,” is the oldest active post in the Marine Corps. It supports both ceremonial and security missions in the nation’s capital and is the site of the Home of the Commandants. The Barracks includes many nationally recognized units, including the Marine Corps Silent Drill Platoon, the Marine Drum and Bugle Corps, the Marine Band, the official Marine Corps Color Guard, and the Marine Corps Body Bearers. SMA members received a guided tour of the Barracks and heard first hand from officers on what qualities and values attribute to successful leadership. Officers at the Marine Barracks Washington, D.C., also known as “8th and I,” discussed leadership qualities and values with members of Mississippi State University’s Stennis-Montgomery Association in Washington, D.C., March 11, 2019. U.S. 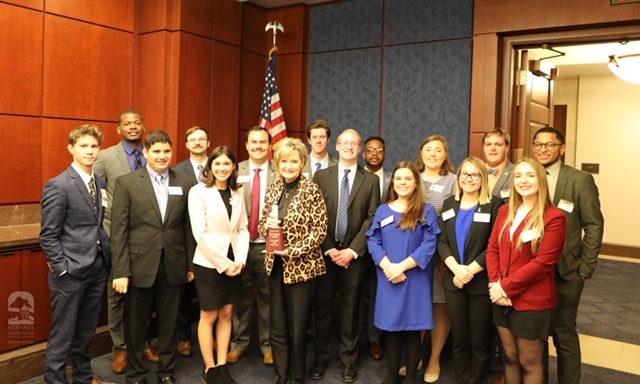 Senator Cindy Hyde-Smith (MS) and U.S. Representative Michael Guest (MS) also welcomed SMA members to lunch with the Mississippi congressional delegation and staff on March 14, 2019. Both U.S. Senator Hyde-Smith and U.S. Representative Guest spoke with students about the value of public service leadership in Mississippi. Students also had the opportunity to talk one-on-one with Mississippi congressional staff members. U.S. 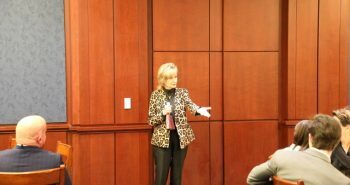 Senator Cindy Hyde-Smith (MS) speaks with members of Mississippi State University’s Stennis-Montgomery Association in Washington, D.C., March 14, 2019.